As a Psychologist and Biblical counselor for the last 28 years, I have been asked these questions often by those I have counseled. I have also personally stormed the doors of Heaven with these questions, both for myself as I have struggled and on behalf of my clients. There is no doubt in my mind that God is good, and that His essence is Love. If we choose Him, His intent is to heal and restore us every time we ask. Without a doubt He is not a perpetrator of any evil or harm to us. That being said please consider the following observations. One day as I was grappling with these questions, I was particularly grieved by some of my clients who were victims of satanic ritual abuse and had gone through atrocities all through their childhoods of ritualistic torture, even sometimes by the hands of their own parents who themselves had been involved in satanism as a part of a long family lineage of satanists. These clients had asked me often the questions of “Where was God?” I needed to know! God took me into a vision of myself standing on top of a tall tower that was attached to a fortress or medieval castle. On one side of the tower, inside the fortress walls, was a gladiator pit where fierce training was happening. The gladiator trainees were sweating profusely, were scarred and many were bleeding from wounds obtained in training. On the other side, outside the fortress walls, were all the troops who had been released into the field. They were lined up in row after row that stretched as far as I could see into the horizon. God said to me, “I will not have my people be picked off by the devil!” The statement was so powerful it took my breath away and I immediately began to weep under the intense presence of God. I knew the entire heart of God was behind these words. These words were from the God that IS Love (1John 4:8,16), and that catches all our tears as we weep (Psalm 56:8). I also knew immediately why He had said it. He was referring to the grueling training that was happening in the gladiator pit. He was showing me one of the main purposes for allowing us to struggle…..so that we will be strengthened so that we can resist the devil (James 4:7) with an emboldened will, by OUR CHOICE to fight. He intends to equip us! He reminded me that He does, indeed have a plan for us, and it is to “prosper us and not harm us” (Jeremiah 29:11). He knows exactly where he wants us placed in the field of battle and will prepare us accordingly for the fight that is inevitable. In His omniscience He knows every plan of the devil and therefore exactly how the devil will try to take us down. He reminded me that He gave us and the devil free will and He cannot take it back or He would contradict Himself. Therefore we have to USE the free will that He gave us to fight the devil and “choose Life”. He knows exactly how we need to be equipped and trained so that we not only are able to fight and resist the devil, but so we can walk out the plan that He has for us. He reminded me that “ALL things work together for good to those who love God and are called according to His purpose” (Romans 8:28). This means ALL THINGS, both negative and positive, grueling situations and times of joy. He showed me that there is a time for us to be “in the field”, actively walking out the purposes of our calling as a part of the rank and file in the army of God, and there is a time for us to be in the gladiator pit, training for battle, learning to wield the “swords” of gifting He has given us; Learning to rightly carry His anointing; Learning the disciplines of humility, sacrifice, and service; Learning how to be wounded and to heal. It isn’t a matter of whether we are going to be wounded by the devil and by others who are imperfect and living in an imperfect world, it is simply a matter of when and how. We have to learn, through the training in the gladiator pit, how to manage the wounding and keep fighting. We all go back and forth from “the ministry field” to the gladiator pit as we need to and as directed by the greatest General. Struggle is the mechanism that God uses to get us from “milk” to “meat” as described by Paul in his letter to the Corinthians (1Corinthians 3:2). Armed with this image, I am now able to remind myself and others that there is a plan, and that all things work together for our good as we learn to love God and to know Him and His Son (John 17:3). Some of us have expressed envy over the fact that others are out in the field and lament, “Why does it seem that I am always in a process of struggle or a process of healing and they are out doing the ministry!” Many times the struggle is proportionate to the calling. For instance, many of the folks that I mentioned who come from a past of horrors of ritual abuse can see that while their suffering was caused by a combination of the devil and the humans that “dance” with him, their freedom is in a God who will, if they allow it, take what the devil meant for evil and turn it to good. Many of them have seen the face of the devil. Who better to man the front lines of the battle, where the most intense warfare occurs, than those that will be less intimidated by direct confrontation with evil? He showed me that there are demonic entities attached to the different strongholds that we all face. There are a finite number of strongholds that the devil whips up. Every time we stand in the face of the devil’s strongholds over us we weaken the power of the demons assigned to those strongholds. This ultimately benefits others with the same strongholds. By facing our battles, standing under the pressure, we are helping others. We are all given assignments as a part of God’s plan for our lives. Paul had many heavy assignments. God wrote two thirds of the New Testament through Paul. His assignments came with a price that he details to some extent in the first chapter of 2 Corinthians. He had a purpose in detailing his struggles, so that the Corinthians would not be ignorant of what he and his fellow ministers went through in the province of Asia; trials that caused them to “despair even of life” (wish they were dead) (2 Corinthians 1:8). The purpose was to illustrate the power of dependency on God, and that God would allow these things if it meant that Paul and his cohorts came to understand the power of dependency. God had all their best interests in mind. What if Paul had despaired to the point that he gave up the mission? He was so beaten down that he despaired even of life, but he did not give up! God only knows the profound negative consequences for so many if Paul had given up and so many did not hear the Gospel. Even more ultimately powerful and consequential is the question, what if Jesus had given up? What if He had not ultimately picked up the “cup” that He asked the Father to take from Him (Matthew 26:39), and He had not gone to the cross? Where would we be? We owe Him our very lives that He did not give up His assignment. What is your assignment? Is it possible that, like Paul and the Lord Jesus, and so many others in the Bible and the history of the church, your assignment at times lies in the middle of struggle…..in the gladiator pit? Remember, God is always strengthening us so we do not get picked off by the devil, and so we can walk out his plan. Struggle is one of the main mechanisms for strengthening. This entry was posted on Tuesday, January 3rd, 2012 at 12:50 pm	and is filed under Blog. You can follow any responses to this entry through the RSS 2.0 feed. You can leave a response, or trackback from your own site. Thank you for sharing this inspirational vision! 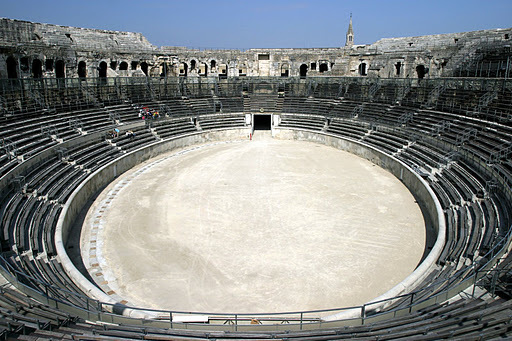 I’m feeling like my family is in the gladiators’ pit right now at this moment in our lives. Your vision along with God’s message here has given me the fortitude and direction I need today. God bless you and keep you.